Puyo Puyo! 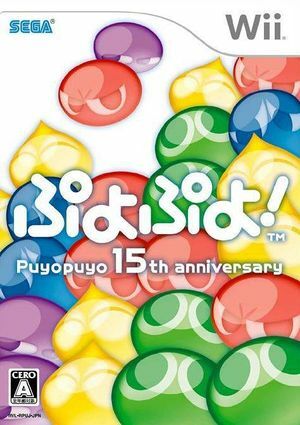 15th Anniversary is another entry in the classic "falling bean" puzzle game franchise. With this Wii game, SEGA has introduced the new "Puyo Puyo Together" mode, where two players play on the same field, working together to guide falling pieces into place. Two pieces fall simultaneously in this mode, meaning you and your Puyo Puyo friend will have to strategize together. The second new mode of play is called "Remote Controller Puyo Puyo." This mode is played using the motion-sensing capabilities of not one, but two Wii Remotes. One controller is used for rotating the pieces while the other is used for moving them. While you can play individually, SEGA seems to want multiple players to cooperate. Puyo Puyo! 15th Anniversary is capable of using both GameCube controllers and Wii Remotes. If a physical controller is set to emulate both a GameCube Controller and a Wii Remote concurrently, it will operate both devices at the same time. To fix, migrate controls to use separate physical controllers. The graph below charts the compatibility with Puyo Puyo! 15th Anniversary since Dolphin's 2.0 release, listing revisions only where a compatibility change occurred.